You have been picking cherries all summer in Western Canada and became addicted to it ? You just arrived as a backpacker in Australia on a working holiday visa and you are already planning on going fruit picking because your bank account is running low ? 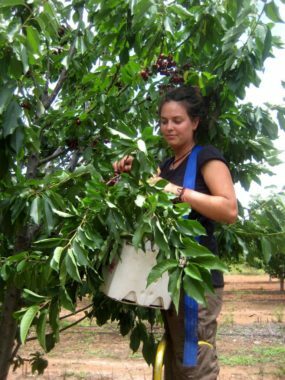 Or you are a professionnal fruit picker looking for a way to optimize your cherry season in Australia ? Here is a post for you. Even if Australia is a small player of the world cherry production (the southern hemisphere is only representing 7% of the world production and Chile is harvesting most of it), they do grow sweet cherries and have gained a really good reputation regarding the quality of their production, allowing them to access several juicy export markets (including Hong Kong, Taiwan, China and Japan). It means that they need good quality pickers and that usually, they are ready to pay them fairly for their work (from what I have seen in Australia , cherry picking is almost exclusively paid on piecework). In Australia, an experienced cherry picker should easily average 200-230$ per day, but it will require hard work, being able to be at the right spot at the right time and, above all, to be well-organized. So let’s explain more precisely how to plan your season and book your picking jobs in advance. Australia has one of the longest cherry season in the world, which is permitted by a diversity of production areas through different climatic zones. Cherry picking can start there as early as October 15-20th and can last till February 20th. During the 2010-2011 australian cherry season, I picked my first cherry on October 15th and the last one on February 19th, with just few breaks in between the different farms (I had 91 days of cherry picking in total but some professional pickers I met on the way even had over 100 days). As in every country, cherry season starts in Australia in the hottest spots and move slowly to cooler areas. Apart from the Northern Territories, every state in Australia grow cherries, and the country count over 700 cherry farms. Geographic areas: South-east Queensland and central New South Wales. The two earliest cherry growing areas in Australia are south-east Queensland (around Stanthorpe) and central NSW (around Griffith-Hillston-Narromine). Most of those farms have about 4 weeks of picking. In those two areas, farms are usually small, with mostly early varieties. The trees are rarely loaded, as the dormancy period is not long enough for cherry trees to bear maximum crop. That’s definitely marginal growing areas for cherries but, for the growers, the lower volume is often compensated by a higher price, as they are the first of the southern hemisphere to send cherries to the market. For these reasons, more than anywhere else, those cherry orchards do care about how pickers are treating the trees (e.g. not ripping buds or breaking branches, not dropping good cherries on the ground, etc.). Most of the farms ask their pickers to do bunch picking. The price, which can vary a lot depending on the block, can be quite high, up to 1,3$ per kg sometimes (but then you probably won’t find many cherries on the trees 🙂 ! ). The biggest farm of this first group, Lodi Pty. Ltd., is located in Hillston (NSW) and covers more than 100 hectares. This company will hire over 350 pickers at the peak of the season, through 4 different contractors (the farm doesn’t hire pickers directly). Their cherries are sent to the Cherry King packhouse based in Griffith, 100 km further south (so if you would be rather packing than picking, don’t bother driving up to Hillston, stop in Griffith). From a picker’s point of view, cherries in Hillston often have a bad reputation (poor quality trees, bad organization, short days picking, high quality standards, etc.) especially for the first two weeks (season is about 4 weeks long from third week of October till third week of November), but in some good years (as it was in 2010 and 2011), it can be quite profitable and also a good way to practice for the rest of the australian cherry season (see the feedback on this farm for more details). Usually, it’s not necessary to book a job in advance, as they have a big turnover (many pickers leave before the end of the season) and are located in quite a remote place. If you want to make sure anyway, you still can call one of the contractor to book a job (I would recommend you call Les (Beverley Roe Labour Contracting (L Piltz)) : Ph 0428861370). Geographic areas: Southern New South Wales/South Australia/Victoria/Western Australia. All these cherry production areas usually start picking around late November and keep picking for about 5 to 6 weeks (till after Christmas or even New Year). Most of the farms would ask for bunch picking and will pay around 60-70 cents per kilogram. 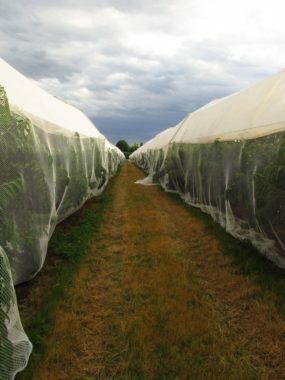 As rain can be a major risk for cherry production (inducing cracking of the fruits), some orchards located in southern parts of the mainland have opted for rain-covered orchards (see picture below), that’s particularly true in Victoria. As a picker, it can be good to look for those covered orchards, as it will reduce the risk of having a bad season. A rain-covered cherry orchard in the State of Victoria. If you don’t want to work in such a big farm, or if it’s too late for you and all the picking jobs are already taken, then spend some time on our australian map, there are over 150 cherry orchards registered, so you might find the secret nugget you are looking for. Good luck ! Geographic areas: mountain areas of New South Wales and Victoria. If most of the cherry farms on the australian mainland are done by Christmas, some companies, in choosing a location at higher elevation for their orchards, managed to extend their harvest period till end of January or even early February. Most of them are based around the city of Orange (NSW) and are producing high quality cherries for the export market. 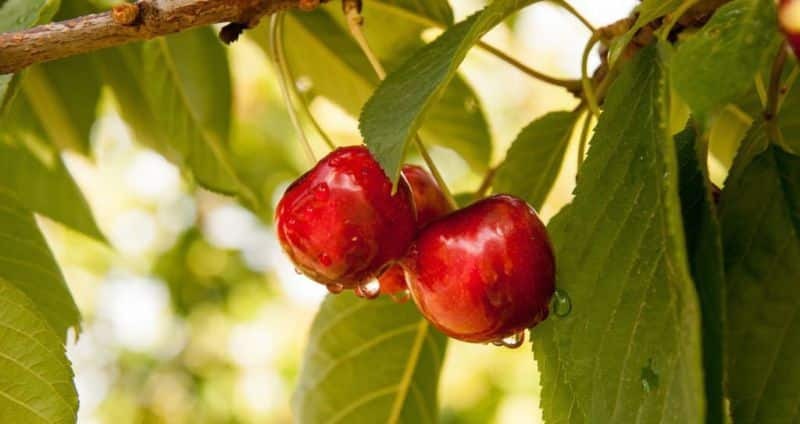 If you are not really keen to travel to Tasmania to extend your cherry picking season, then those orchards could be a good way for you to get some extra days picking on the mainland : Carinya Orchards, Rossi Orchards Pty. Ltd., Sunnycrest Orchards Pty. Ltd. In planting their Tolmie Orchard in the victorian highlands, the company Cherry Hill Orchards is even expecting to produce some cherries till end of february or even early march, which could be even later than the tasmanian season. Tasmania is often referred to as heaven for a cherry picker, as it has many cherry farms (over 60), produces some of the biggest cherries in the world, late in the season, and can be picked without the needs of a ladder. But you have to be conscious of an important thing : the vast majority of the tasmanian cherry companies will ask their pickers to single-pick (you must separate the stems of the cherries, so that all of them are single in your lug). It might take you a few days to get used to it but once it’s done, you should make decent money as they usually pay a lot better than for bunch picking, i.e. around 1$ per kg. Most of the farms will pay you between 8 and 10 $ for a 9kg lug (see picture below), at a flat rate for the whole season (it doesn’t matter which variety or block you are picking). Cherry picker filling a 9kg tasmanian lug. As Tasmania is quite a big island, with diverse climatic zones, the different cherry orchards don’t harvest their fruits at the same time. Once again, northern farms will start and finish their season before the southern ones. Then, the earliest tasmanian cherry farms, located around Devonport, Launceston and the Tamar valley will start picking around the third week of December and keep going till late January. Here are some of them : Perfecta Produce, Spreyton Fresh, Top Qual Calthorpe Pty. Ltd., GC Miller and Sons. The cherry orchards located around Richmond (north-east of Hobart) and the Derwent Valley (north-west of Hobart) will start about ten days later (around early January) and finish around end of January. Here are some of them : Reid Fruits Cherry Orchards, Nic Hansen Tasmanian Cherries, J.W. Kirkwood, Hansen Orchards (Bushy Park). And finally, the last ones to start and finish in Tasmania (and basically in the southern hemisphere) are located in the Huon Valley, around Huonville, Cygnet, Port Huon and Franklin. Depending on the sun exposition of the orchards in the Huon valley and the utilization or not of GA (a chemical which delays the maturation of the cherries), some really close farms can have a difference of up to two weeks between their end of season. From what I am aware of, the last cherry farm to finish the season is Hansen Orchards (Huonville), which sometimes keep going till third week of February. Here are some other famous orchards of the Huon Valley : Lucaston Park Orchard, BW Griggs and Sons, Tas Valley Orchards and Glenburn Orchards. If it’s quite easy to find a cherry picking job just driving around in Tasmania in early January, getting a spot in one of the last farm to finish the season is a lot more tough, and will require early booking (November or early December) or a good plug. This is especially true for Hansen Orchards (Huonville) and Reid Fruits Cherry Orchards, which both have application form online for picking jobs. You made it to the end of this post, congratulations 🙂 ! Let us know if you would like to have a post treating of one cherry growing area with more precisions, it would be a pleasure for us. Also, feel free to comment this post . As it’s one of the first post on the website, we definitely need your feedback. 24/10/2016: Cherry production reduced by 50% ? 29/10/2015: Bumper crop but low prices?